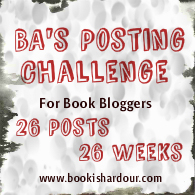 As mentioned previously, I'm participating in Bookish Ardour's Posting Challenge for book bloggers. While I don't consider myself a dedicated book blogger, I have been writing about books more often recently thanks to my Off The Shelf 2013 challenge. Also, a lot of the topics are generic enough for a general blog like this one. Because books are obviously at the forefront of my mind right now, this is as good a time as any to do a bit more book blogging. So. Today's prompt asks, "What do you love about book blogging and book blogs?" The truth is, I don't usually read a lot of book blogs. I read all sorts of other blogs - Fat Acceptance and Feminism and Personal ones, work-related ones, random ones that I read a post or two of and then never see again - but there's very few book blogs in my Google Reader (yes, I'm still using it, I haven't had the heart to find a replacement yet - why do you do this to me Google? WHY???). Ahem. Goodreads has started recommending books to me now, but it's still a bit hit-and-miss it seems. I'm also very much a "judge a book by its cover" person - I pick up books with interesting covers, and I always read the blurb on the back cover (to the horror of a friend of mine). I'll also pick up new books based on friend recommendations...But I suppose if you find a good blog, with similar tastes in books, then that would be like a friend recommendation, wouldn't it? So, if you want to recommend me a good book blogger who blogs about fantasy fiction, I'm all ears. What I love about writing my own blog is the way it lets me get thoughts out of my head. I like sharing and connecting with other people, although I'm honestly still surprised when people comment on my posts or share them with other people on social media and stuff - I tend to treat my blog a bit like a semi-public diary and never really consider that other people might find it interesting. Mostly I blog because I like to write. I have a general personal blog without any particular direction because I like being able to write about whatever comes into my head. I go through bursts of high activity and then weeks with no activity at all. What I'm saying is, if you're new here and expecting regular posts about books, you'll be disappointed...But if you stick around you might find the occasional diamond in the rough.